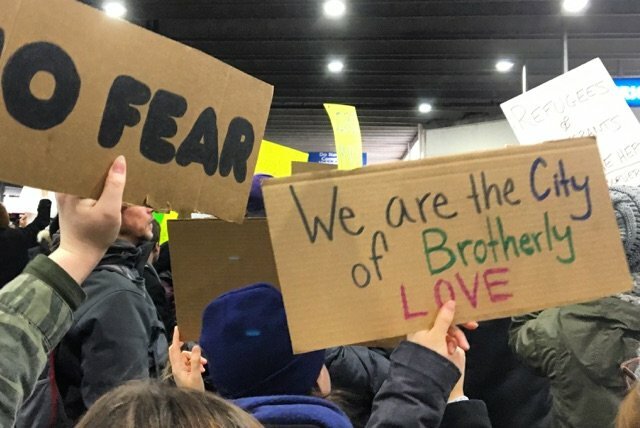 Demonstrators filled the international terminal at Philadelphia International Airport on Jan. 29, 2017, to protest President Donald Trump's executive order halting the Syrian refugee program and temporarily suspending immigration from seven majority Muslim countries has sparked protests across the country. Last Thursday, members of Philadelphia's immigrant community made their presence felt through their absence, joining thousands in cities around the country for a walkout that forced the closure of businesses that rely on their labor. Then Tuesday, as fierce debate continued to swirl around the Trump administration's efforts to restrict travel to the United States and ramp up deportations of undocumented immigrants, Philadelphia joined a national campaign to underscore the impact that immigrants have on the American economy. Led by the nonpartisan New American Economy, an alliance of mayors and business leaders committed to immigration reform, the "Map the Impact" initiative presents an interactive map with local data on the immigrant community in each U.S. Congressional district, as well as at the state and metro area levels. • 614,660 foreign-born residents who make up 10.2 percent of the Philadelphia metro area’s population. • Immigrants paid $6.0 billion in total taxes, which include $1.7 billion in state and local taxes and $4.3 billion in federal taxes. In 2014, they held $15.8 billion in spending power. • Immigrants make up 17.6 percent of Philadelphia's construction industry, 17.6 percent of its tourism, hospitality, and recreation industry and 16 percent of the manufacturing industry. Philadelphia, a sanctuary city whose federal funding sources have been threatened, last week became one of 33 U.S. cities to challenge President Trump's first travel ban in federal court. On Tuesday, as indicated by Trump, the Department of Homeland Security issued a sweeping set of orders to increase deportations that could jeopardize nearly 11 million undocumented immigrants living in the United States. The memo's enforcement directives now extend beyond those with criminal histories, although protections will remain in place, at least temporarily, for those covered under the Deferred Action for Childhood Arrivals program. The full DHS memos can be found here and here.